Join your exclusive host and author of the No. 1 New York Times-bestselling OUTLANDER series, Diana Gabaldon, for a week on the Rhine River. With 35 million copies in print in 43 countries and 39 languages, Ms. Gabaldon’s OUTLANDER series has added to the storytelling tapestry of our lives while also inspiring travel with her literature. Her award-winning series on STARZ has brought to life the backdrops of Scotland, North America, France, Germany as well as dozens of destinations across the globe. Join us for this special departure with Diana Gabaldon, an inspiring storyteller sharing an inspired cruise–and daily excursions–with an intimate group of her fans. 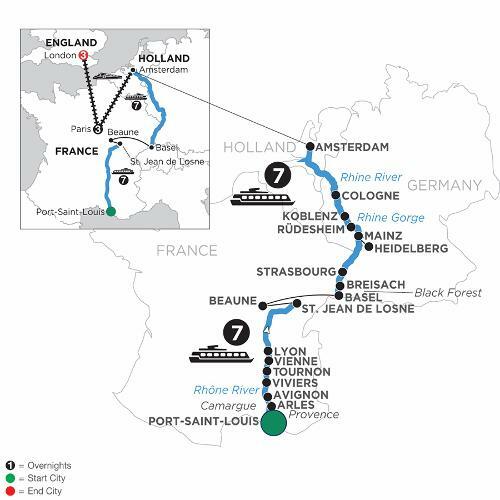 This delightful river cruise and land vacation is an exciting opportunity to learn all about France and the French. Your adventure begins in Port-Saint-Louis, here board your ship and sail into the peaceful Camargue area. Arles, Avignon, charming Viviers, medieval Tournon, Vienne, France’s gastronomic capital of Lyon, as well as St. Jean de Losne and fascinating Beaune await you in France. Travel by motorcoach to Basel and embark on a mesmerizing journey along the Rhine River. Enjoy guided sightseeing in Strasbourg, Koblenz, and Cologne, as well as an excursion to the Black Forest and to Heidelberg—Germany’s oldest university town. Sail through the dramatic Rhine Gorge, the most beautiful stretch of river dotted every mile with castles. You can choose to visit the Gutenberg Museum in Mainz, see the legendary Lorelei rock, and enjoy a canal cruise in splendid Amsterdam. Then you’ll transfer to Paris by high-speed train for your Monograms vacation package. Your 3-night stay in the “City of Light” is complete with a local host® and expert guides to assist you with everything you need to discover Paris. You’ll take a high-speed train from Paris to London for a 3-night stay in this dynamic city. See such traditional sights as Westminster Abbey and the Houses of Parliament, and visit St. Paul’s Cathedral, the iconic cathedral where Prince Charles and Lady Diana were married. Take photographs of the iconic landmarks, including Buckingham Palace, the London Eye, and the Shard. All of this, and plenty of free time to explore on your own, gives you variety, convenience, and the chance to make this fabulous vacation your own!